What do people love more than a coffee? Coffee in a café. Straight from the heart of a coffee lover, there is no other feeling more fulfilling than having a freshly brewed cup of coffee and this feeling multiplies if you experience it in a café. People would start with the common and the most obvious tip of the time that you should use a high-quality coffee bean and the magical soy milk in your café. This apparently should be enough for tempting the customers and then convert them into the loyal lovers, but do you really think it’s enough? Or do we need interior designing tips to cover other areas? We live in the age where people want to relate to the art and want to share their experience using the internet. Cafés have become a profound source of experience and a timeout from a daily routine for many. Logically thinking, café owners are leaving an impression on the visitor’s mind even before they sip that cup of coffee simply by engaging people through café’s interior designing. This definitely improves the chances of your first-time visitors to come back again in the café and maybe, become regular. It is believed that more than 50% of the cafés and restaurants can’t function beyond the first year due to lack of good customer service, an uncomfortable interior designing or a low food quality. To overcome this, we are guiding you with the café ideologies which helps you to come up with the brilliant plan of success using the interior designing tips, especially in the interior designing area. Café interior designing has a limitless list of ideas to chose from and the final design decision is always personal. Some people like the minimalistic approach inspired from the Scandinavian design, on the other hand, some like the rustic look of the recycled wood. Some visitors go to cafés to experience good long hours with friends, whereas others like to just pick their coffee on the way to work or something. So, how would you make a café which would cater to a wide range of audience? We sure can. An interior designing industry must deliver what’s in demand as well as what works. That’s why we are listing some of the interesting interior designing tips for you to achieve a wholesome experience in every facet of the café which could be irresistible for the coffee lovers. Amid of the trending themes like the vintage industrial style, minimalist, or contemporary design, embracing simplicity in the interior designing brings the long-term impressed audience. 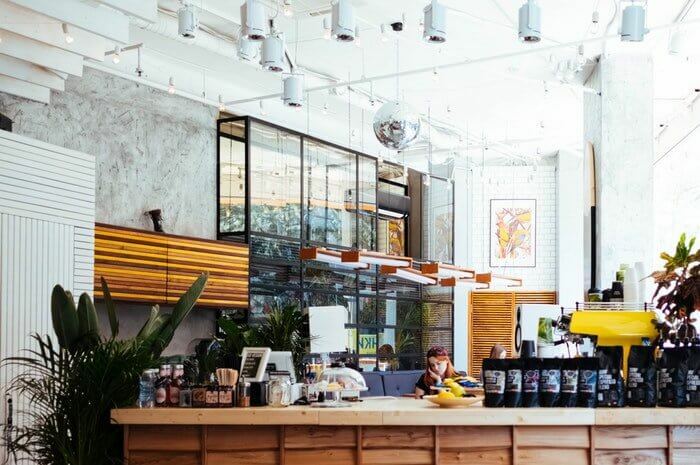 Café owners usually get confused while concentrating on the themes too much and they are unable to understand where to stop the designing process which leads to the cluttered environment. A designer should aim for the interiors which can convey the theme ideas in a right way without complicating the structure. Comfortable and practical set up creates an environment which is inviting for customers to relax and have a good time in the simplicity. 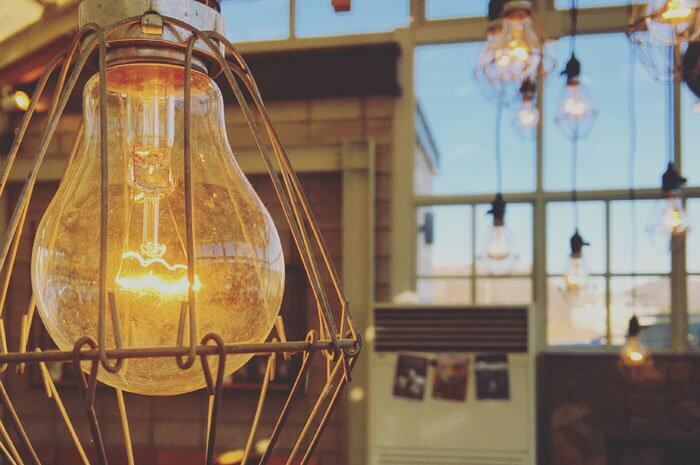 To illustrate it simply, pendant bulb hanging lighting style clearly conveys the simple yet artistic style. 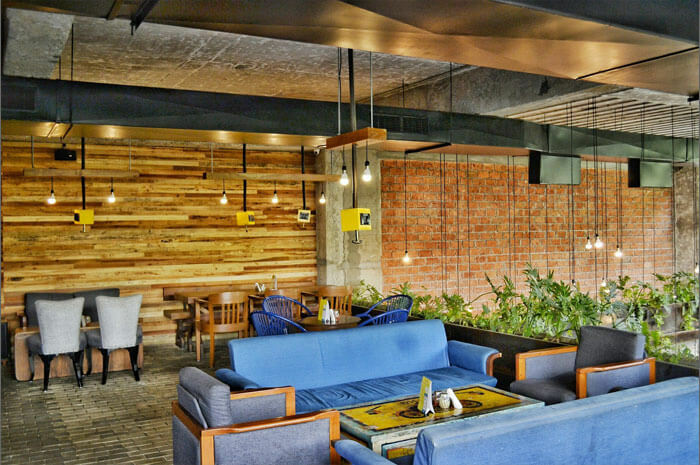 You don’t need to be complicated to showcase the best interior designing in your cafe. When a customer enters a café, they immediately attracted to the place which would add more joy to the morning coffee time. It becomes very important for the interior designers to craft a design which provides comfort and ease to the customers. A comfortable yet stylish furniture makes your customers loyal to the surroundings. Apart from simply choosing the type of furniture, the placing of the furniture in the right corner is also an important decision. Every customer has a subjective choice for the seats such as some are looking for the practical stools or chairs to do an attentive work and others just want to enjoy the cozy set up. A perfect café would have a furniture for everyone keeping comfort, style and theme symmetry in check. Most projects are budget stringent and limit the cost for the bulk objects in the café interior designing like repeated accessories, furniture, lighting etc. This directly impacts the quality of the furniture or accessories if you are trying to meet the volume at a low-price rate. For example, compromising on the quality of coffee beans or tea bags would directly be judged by the palate of your customers and this would absolutely impact your café’s foot-fall. Similarly, the quality of the furniture and other interior elements would impact the psychology of your customers as well. You should be aiming for a café which sets you apart from the other options around the corner, so you should give your customer an authentic experience. A good quality lasts longer and proves to be a good investment decision in comparison to the low-quality interiors. Whether you are picking the lighting accents or choosing some furniture type, connecting two different elements with a style would lead to the uniqueness (if done right). 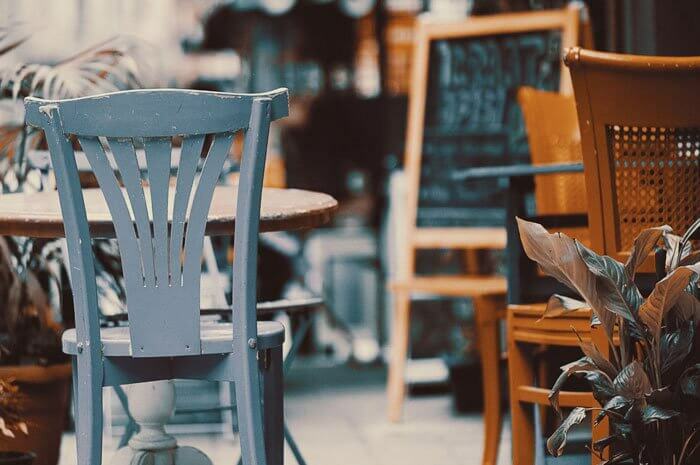 In an interior woodwork, you can pick different vintage chairs and tables for the furniture but match them at some tangent like color shade, wood quality, or probably a designing style and this keeps the harmony of the café’s interiors. When experienced interior designers attempt such experimental mix and match, they tend to create an extraordinary style for the café with the perfect balance. Uniqueness draws people’s attention and eventually a higher footfall in your café. 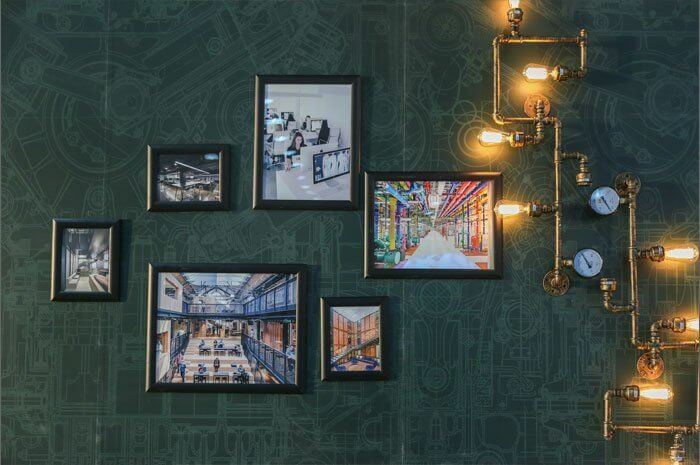 To bring a quirky edge, you need to pick the artsy and interesting décor pieces to add character to the café. It could be anything from the vintage looking clutter of lights to a magic decor inspired from “Harry Potter” series. In short, anything which would make people inspired, happy and involved with the surrounding ambiance. We can’t ignore people’s love for the social media nowadays, and we need to give them all the reasons for being at your café and post those Insta worthy clicks. Apart from keeping the café interior design model aesthetic and interesting, it is equally important to enjoy the entire process of designing and creation. Whether it is done personally or with the professional, you got to add a bit of a personality to the interiors which would make the place enjoyable to be for both the owner and the customer. In conclusion, a successful café has checked all the essential aspects with the equal interest. 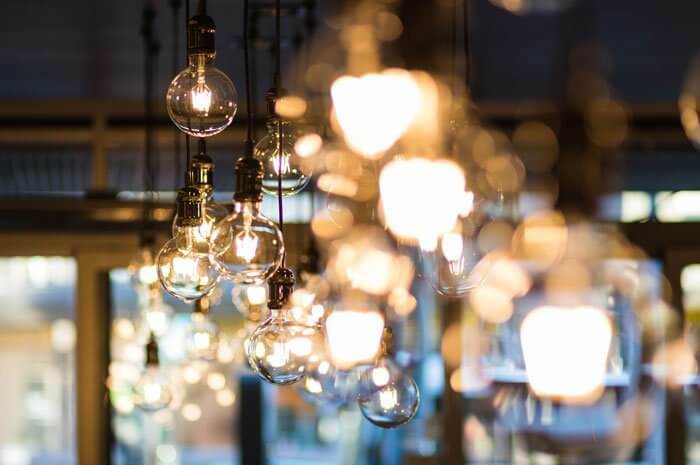 We would be delighted if these interior designing tips could be useful for your café, though these can also be applicable at the boutique shops, pubs, bar, restaurant or even lounge area in your house. BluEntCAD caters to the interior design drafting service across the world and we work with many creative geniuses who work with the charming artsy approach. Our team of drafters prepares the interior designing drafts with the perfect details shared by the interior designers. If you find these interior designing tips useful and have your café designs ready, let’s brew it, oops draft it for you.